On the fourth day of the trip it was time to split up with the engineers for a time. 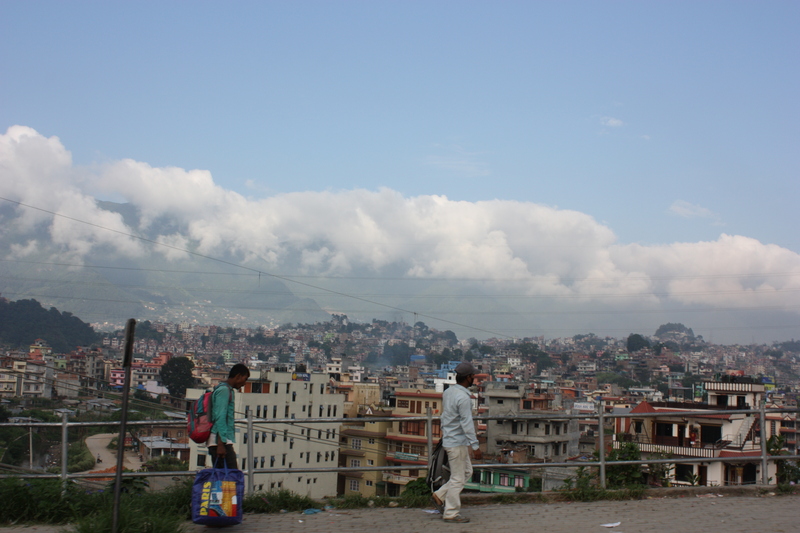 I went back to Kathmandu to get a head start on the drawings while they went to a region called Dhading to do market research and look at more houses. On the drive back it was still quite cloudy and we got a magnificent view of clouds gathering above and below us. So even though I didn’t get a glimpse of the Himalayas on this trip because in monsoon season it is rarely clear enough, I was put in awe by the clouds. 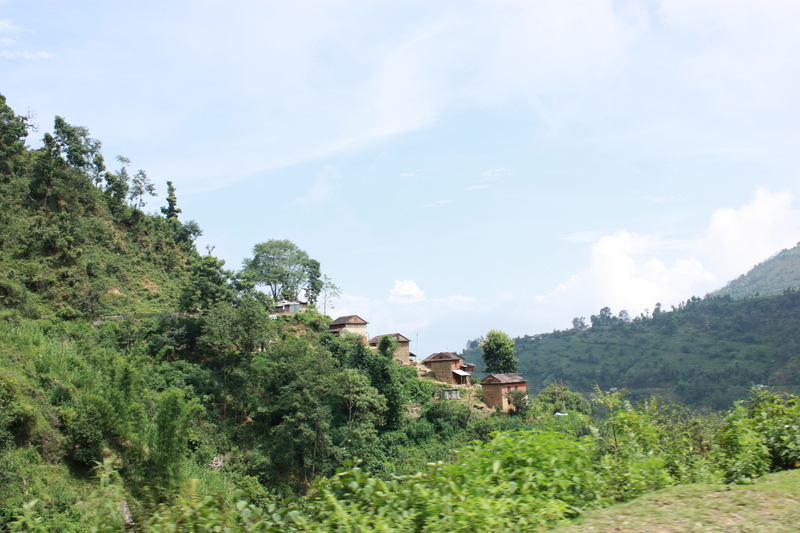 As we got closer to Kathmandu the drive felt a bit like a video game as we cut in and out to pass large, slow moving trucks on the twisty road. Back at Tearfund headquarters I put together a makeshift desk and began producing rough drafts of the drawings. It was fun to hand draw after such a long time! On our third and final day in the field we visited a region called Agra. This time we were a bigger group because Rita, Tearfund’s new shelter advisor, joined us. 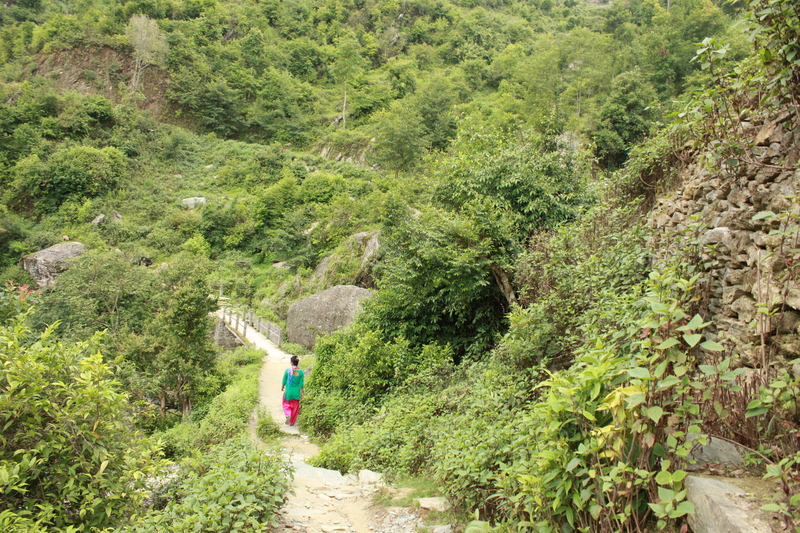 It was another journey down a narrow, bumpy, and curvy road. On our way there we drove into a cloud. While we walked around the sun would occasionally find its way through, but for most of our visit we remained inside the fog. At times it gave an eery feeling to the surroundings, especially when we came upon the ruins of a house. Once again we were welcomed by the people we met. The people kept wanting us to go further to see more houses, and eventually I think half the village were following us down the hillside! We left early from the field because the wind started to pick up and the fog was getting wet. It was possible that rain could create bad road conditions. Getting back to Palung early afforded us some time to develop the list of drawings we thought needed to be included in the manual. It was a challenge to stay within our original scope so that we could accomplish the work in the week we had left! – I ate a peach and pieces of pear (naspati: it tasted like a cross between an apple and a pear) that were offered to us by some of the villagers. Even though I knew I might regret it later, I decided to accept and eat them. Lo and behold I had some indigestion later on as a result. – I learned how to say thank you in Napali, which is “Dahn-ya-bahd”. The group quickly came across a great way to remember how to say it: “Dan ya bad”. Dan wasn’t such a fan of this discovery and we would jokingly remind him of it for the rest of the trip! 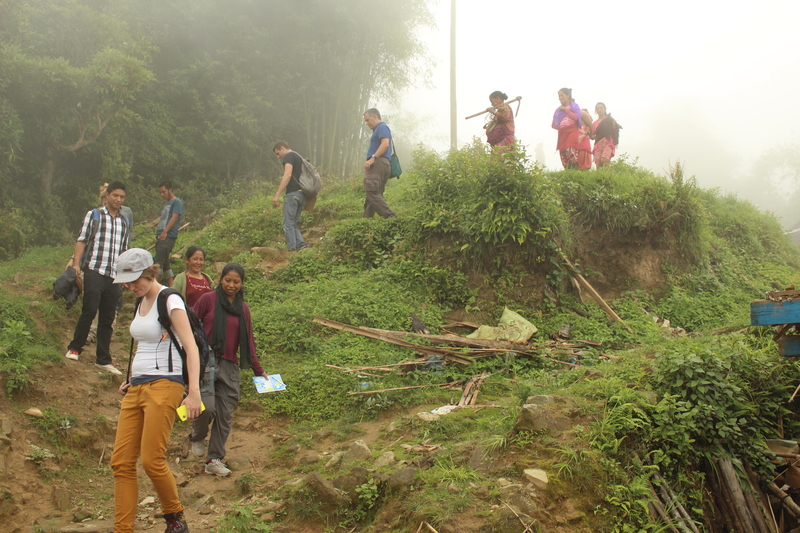 The following day we headed out to Tistung, another region where Tearfund has beneficiaries. This region was a bit more out of the way and we needed to take a narrow dirt road that wound up the foothills. In some areas the houses showed significant cracking and so even though they were still standing, people were not living in them since another earthquake could bring them down. In other areas the houses were completely collapsed, probably because the forces of the earthquake were greater in those areas. The people we met were very welcoming and eager to show us their homes and share their stories. We found out that the earthquake actually happened during the day on a Saturday which was probably the best possible time since most people were not in their homes. We began taking note of common characteristics across the traditional houses that would inform the training guide. On our way back to Palung we stopped to see a waterfall and a small footbridge that were near the road. We encountered a woman shepherding a herd of goats across the bridge. 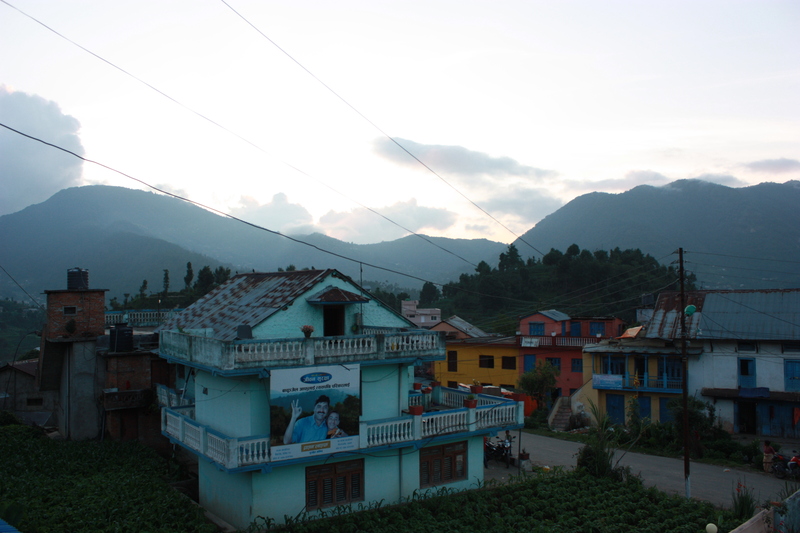 Early in the morning on our second day we left Kathmandu and drove three hours south-west to a town called Palung. After getting out of the bad Kathmandu air the drive was very nice. The road curved out of the valley and twisted and turned through the foothills offering amazing views of the tree-covered hills and stepped farm terraces. On the way there we stopped at a cluster of houses on the roadside to begin our task of studying how they were originally designed, how they failed structurally, and what peoples’ plans are for rebuilding. The destruction was hard to see. We learned quickly that people are fearful of rebuilding with stone. 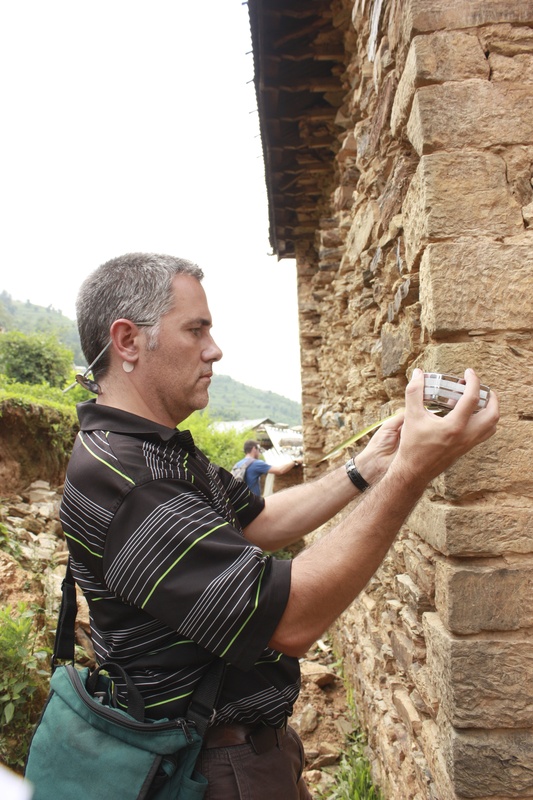 It is unfortunate since stone homes can be earthquake resistant if built properly. Stone is also a free material, people have a large amount of experience building with it, and it is also suitable to the Nepal climate. People are considering building out of timber and corrugated metal sheets for the roof and walls, but it would do little to protect against the elements and would probably only last a year or two. Tearfund has quite the task ahead of educating the builders and homeowners about the improvements that can be made to stone masonry construction. The goal for our team will be to make the manual as comprehensive as possible and communicate the key elements of the building that need be addressed. – I came across a gigantic cockroach in my hotel room. 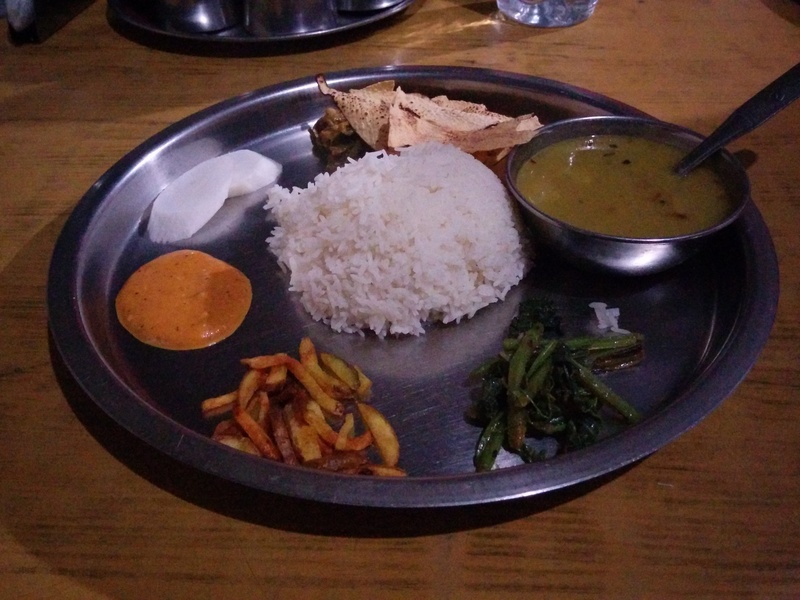 – In Palung we had the traditional Napali cuisine of rice and dal (lentil soup). It was delicious and very spicy! 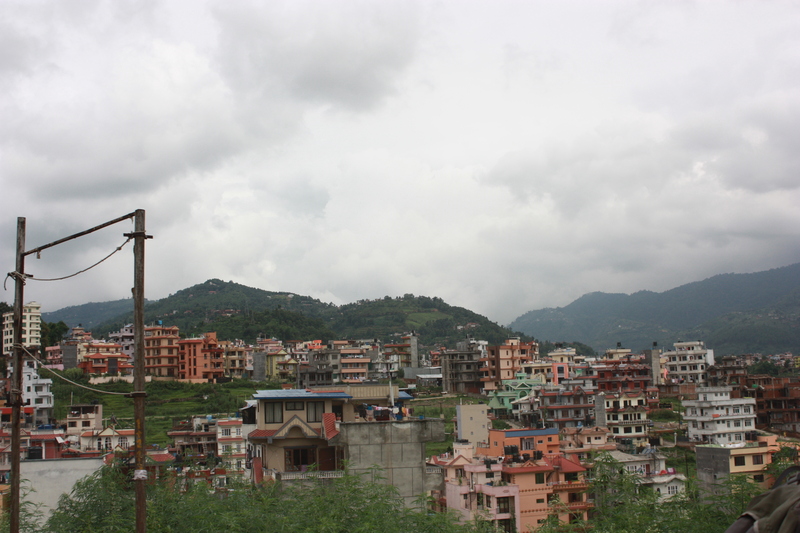 I can hardly believe that I am writing this post from Nepal. I arrived late Saturday night after a long flight with stopovers in Chicago and Abu Dhabi. If you asked me a month ago what I would be doing in mid-July, this would not have been my guess. 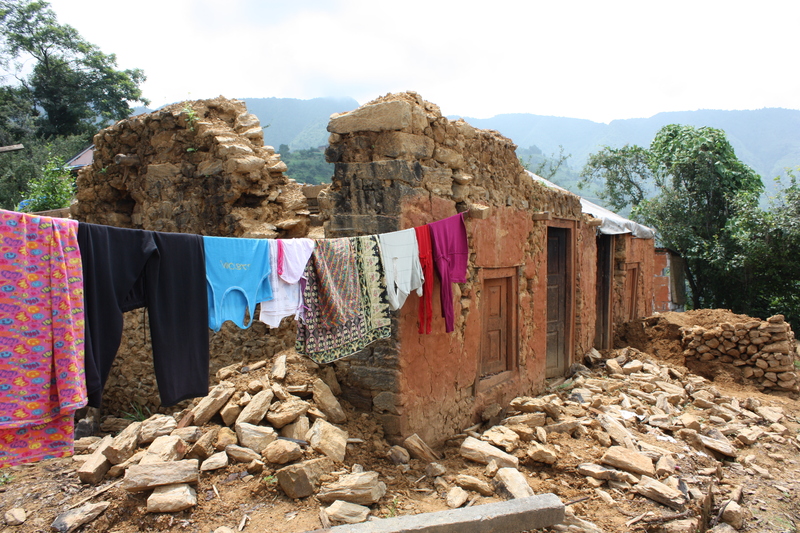 The opportunity came last-minute when I received an e-mail from Engineering Ministries International (EMI), an organization I have worked with in the past, calling for volunteers for a Disaster Response (DR) trip to Nepal. I was on the DR e-mail list because I did DR training at EMI’s ACDP Conference (Association for Christian Design Professionals) back in 2012. Since I had finished school, I decided to respond with my availability. I flew out two weeks after finding out I would be going on the trip. During those two weeks I did a lot of research into stone masonry construction. I am in a team with a project leader and structural engineer to propose improved construction methods for a housing rebuilding project that is being implemented by an organization called Tearfund. The issue that we are addressing is that people are already starting to rebuild their homes, but are often using the same methods as before. We intend to propose very simple solutions that work with their current methods to make their homes more earthquake resistant. We will develop a manual that will be provided in training to local builders and homeowners. 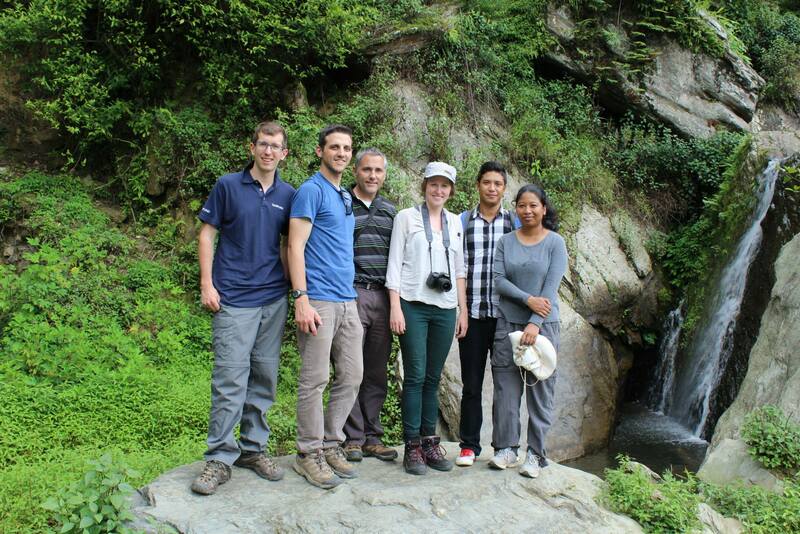 We spent Sunday in Kathmandu at the Tearfund headquarters. We went to an international church in the morning (apparently Nepali Christians worship on Saturday) and then met in the afternoon with the Tearfund representatives to plan out the next several days. 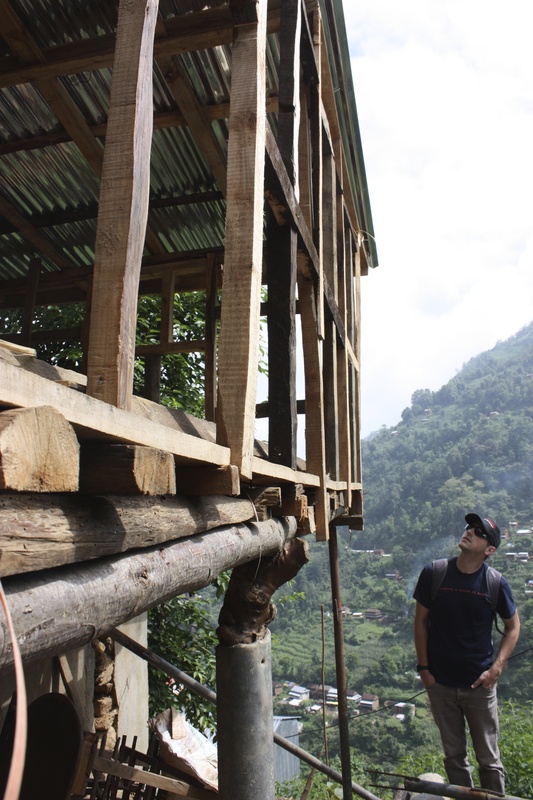 On Monday morning we drove three hours to the Makwanpur region where we are spending a few days to study materials, costs, current building methods, and where the houses failed. Please continue to pray for safe travels, good health, and effective work and interactions. I pray that even though we are doing very physical work and won’t have time to develop deep relationships, that through our actions people will experience God’s grace. I look forward to updating you on how the trip goes! If you are interested in learning more about EMI or supporting them, check out their disaster response page on their main website. Since finishing my thesis I have been in a strange period of being on holiday while still working on my own personal projects. From June 28th to July 1st I visited my Aunt and Uncle and my cousins’ families that are in Trenton area. It was good to visit since I hadn’t seen them in over a year! On Monday I spent the day visiting Janice and Ian and the kids and hanging out at the pool for most of the afternoon and doing slack line. Then on Tuesday I slept in quite a bit and then in the afternoon joined Janice, Marie, and the kids to the regional farm auction. I hadn’t been to a farm auction since I was a kid and so it was fun to walk over the mezzanine and look down at the animals, and also sit in the auction area and listen to the auctioneer fast-talking. First we sat for a while at the smaller pit for the sheep and goats (the baby goats were so cute! ), and then went over to the bigger pit to see the cows. It was fun to re-experience the farm auction, this time with more of an architectural perspective: paying attention to how the animals were temporarily stabled, how they were efficiently hoarded into the auction pit and then back out and onto the trucks. Before heading home Janice bought a rabbit! On their small farm they had puppies, kittens, chicks, goats, and rabbits! 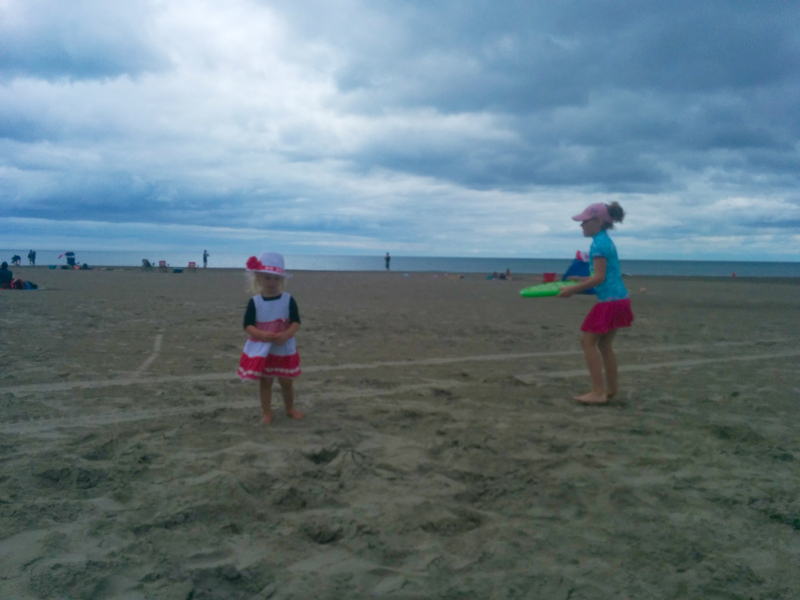 The following day we went with the entire extended family to Cobourg beach as is their annual tradition for Canada Day. 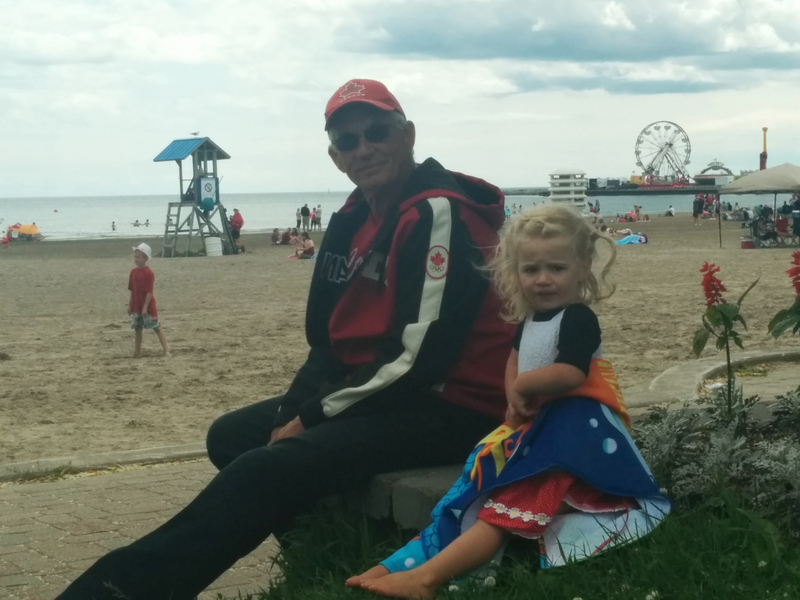 I had a great time playing with the kids in the sand, taking them down to the water at one point, and spending some time just observing the view and laying in the sun. One constant task was to keep an eye on the three-year-old twins who were snookerdooks and would constantly go walking off in different directions! The only way to keep them in one place was to feed them or bury them waist-down in the sand! 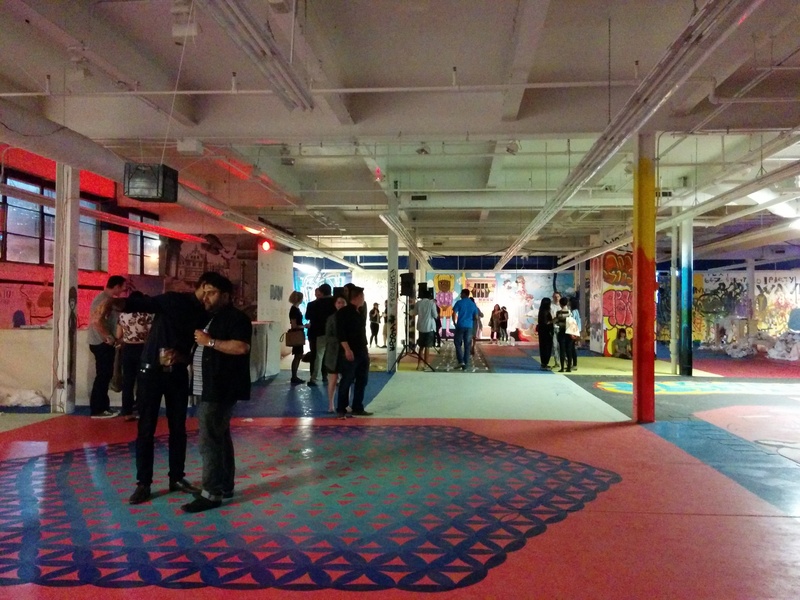 On June 25th I went to the RAW Canvas party. It was a party planned by RAW Design that was open to the design community. The party was held in an empty industrial building near the lake that served as a canvas for a multitude of murals that were painted throughout the afternoon and evening. There was a DJ, drinks and delicious appetisers, and fabulous paintings and installations. 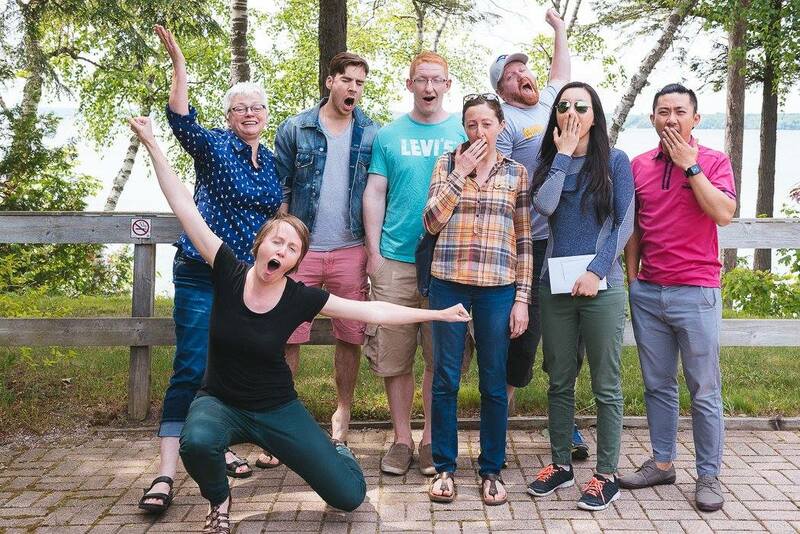 It turned out to be quite the reunion as I saw many familiar faces from Waterloo Architecture! It was a memorable evening! I got a pleasant surprise when Kate texted me inviting me to go see the Once musical since she had won free tickets. Cam and Andrea also joined us. Kate and I arrived early so that we could go on stage while people were coming in to be seated. I ordered a beer from the bar on the stage and we got to whisper “Hello” to the piano and enjoy seeing the set up close and looking out onto the audience. 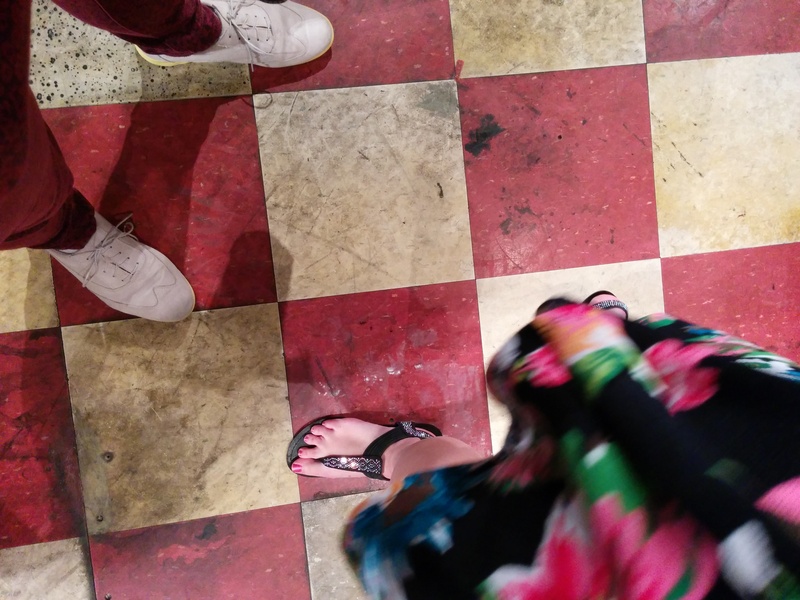 The set was very simple with a curved wall covered in old mirrors, a wooden bar, and a checkered floor. I thought how fun it must be for the set designers to make the mirrors look rusty and the floor all scuffed up! After fifteen minutes on stage the actors came out and started playing songs and dancing right in front of us! Then we took our seats right before the musical began. It was definitely worth seeing. The acting and music were great! I was so inspired that I went home and learned “The Hill” on piano! The weekend following my thesis defence I went to the Toronto Christian Professionals Retreat that was organized by my church. 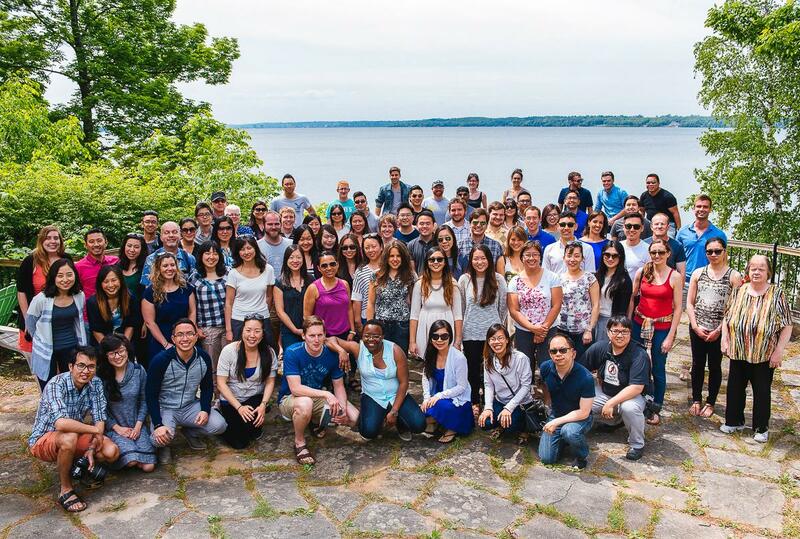 It took place at the Kempenfelt conference center just outside of Barrie on lake Simcoe. It was a much needed opportunity to get away from the bustle of the city, take time to meditate and pray, and develop new friendships with people from my church. The theme of the retreat was “Life Together”, following Dietrich Bonhoeffer’s book of the same name. We had several sessions throughout the weekend that focused on what it means to be a Chrisitan community, what it means for a Christian to minister to others, the importance of time alone with God, and the importance of confession and communion. The retreat challenged us as a church community to serve and be accountable to one another, and as individuals to grow in character to be more like Christ. 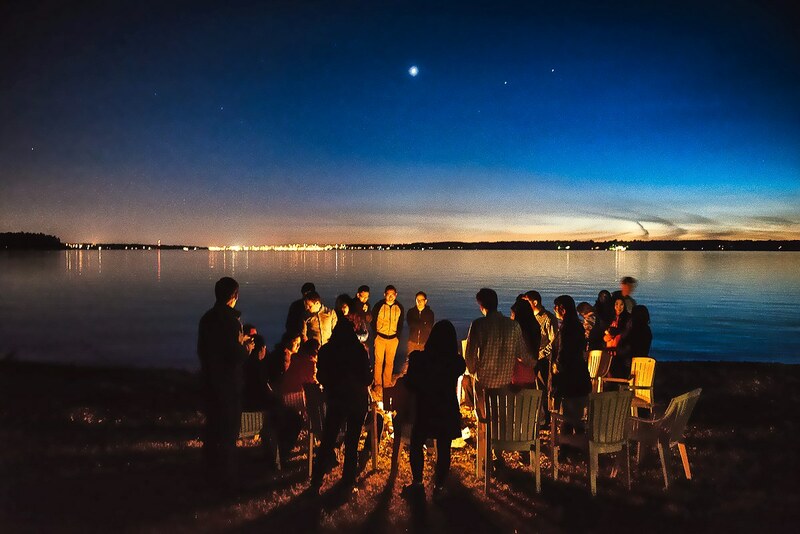 On Saturday we had some group sports, some free time where I hung out by the lake and soaked in the sun, and in the evening we had a bonfire right on the water. It was good to be reminded of God’s beautiful creation both in the natural surroundings and the variety of amazing individuals that I met. Photo credit belongs to Leemarc Lao.